I absolutely love scarves as a little pop of color in my drabby winter outfits 😛 So I made an aqua scarf to give me some of that extra pop I need! 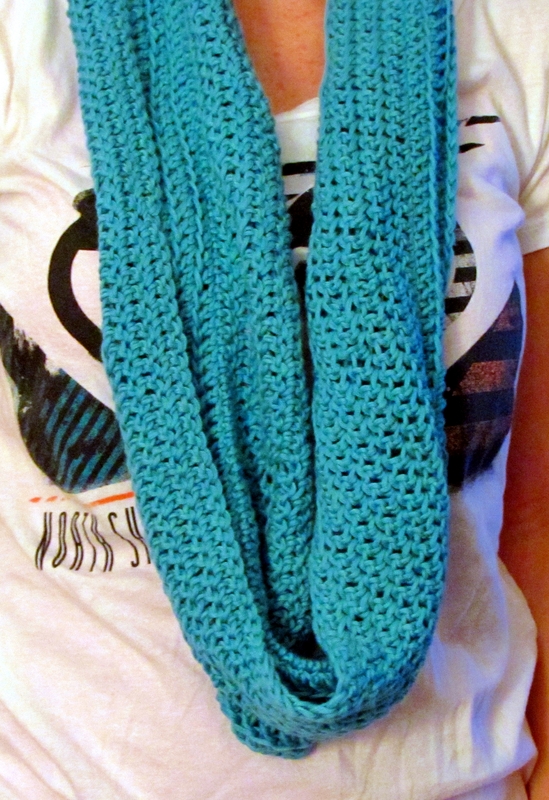 It’s just your traditional loop scarf but done with a little twist – literally I twisted it while crocheting so it automatically curls right where you want it to! I kind of made my own pattern as I went and I’m currently making another one in a thicker material to see if it works out just as well. 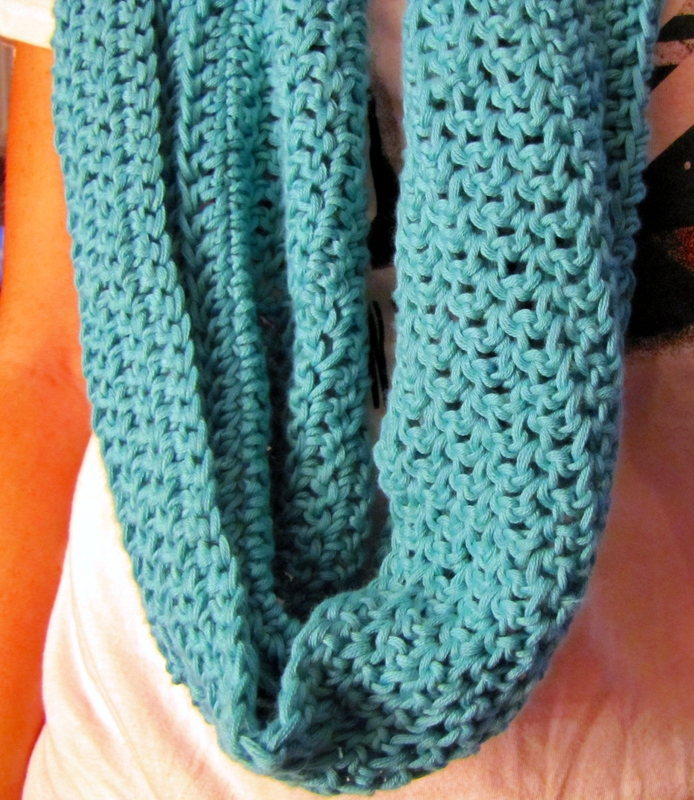 This scarf is really light weight soft and easy! It took me two days to make it which I am really excited about because these days I need fast easy things to accomplish! It seems like for the past few days I’ve been avoiding my craft table. I’m not sure why really because I have a LIST of things I want to do and I’m really excited about it – I think I’m having trouble juggling everything else and feeling guilty about spending time crafting when I need to be cleaning or doing chores. I’m hoping to get most of my chores finished tomorrow because Thursday I am having a guilt free craft day and by that I mean I’m doing NOTHING but crafting (and BNRing) and really this time – no distractions! I need to get inventory BOOMING because it’s the end of September and I’m starting to freak out that my table is going to be bare. Which it’s not because I do have quite a few things – just not everything I want and I’m not quite sure how much I really need. Another reason I haven’t been at the craft table working is because I’ve been in the mood to crochet. It seems like that’s all I feel like doing these days! I’ve constantly got yarn on my mind lol. Okay moving on – so things to look forward to. More scarves 😛 (if you hadn’t figured that one out already) the beaded wall art that I keep saying I’m going to finish. I’m actually going to work on that Thursday. I’m holding off on doing the pillow covers out of Polo’s until I find the right size pillow I want to do. There’s some new fabric that needs new homes on burp cloths and some scraps I really want to make something simple easy and fun out of. I’ve been scoping out ideas for those! Let’s see how much I can accomplish in one day! Should I add another to my list?